Recent trends in IT today that drives everything are mobile, cloud, big data, and social. Gartner calls this as “nexus of forces” that “is transforming the way people and businesses relate to technology”. 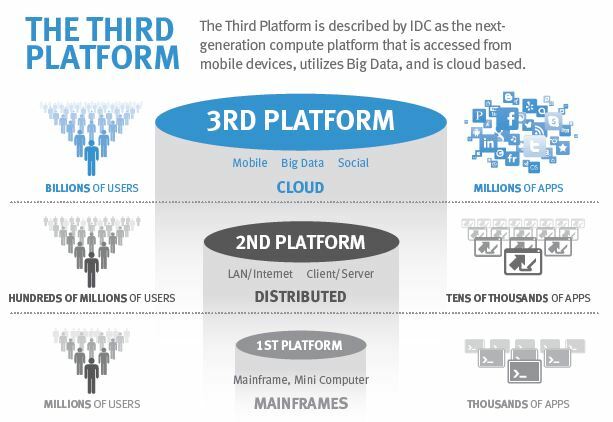 These trends are really underpinning a shift to what IDC calls it as third platform. The First Platform was around mainframe with millions of users and thousands of applications. Second Platform is what we saw last decade about client/server and distributed computing that has increased the number of users by 100s of millions and tens of thousands of apps. The 3rd Platform is a new era that we believe is going to be driven by mobile devices. Order of magnitude difference in terms of scale for third platform is billions of users and hundreds of millions of applications. Organizations, with the complexity of today’s IT environment, wants to lower operational costs, increase their revenue, and reduce risk. Organizations that can tap into the third platform users and applications can create a converged vision that supports business goals and leads innovation. Overwhelming data growth outstrips the ability of traditional storage systems and drives the need for a new breed of solutions that can strike a balance between the simplicity and the cost-effectiveness of the public cloud and the control and reliability of traditional enterprise IT. Elastic Cloud Storage Appliance (ECS), powered by EMC ViPR, provides a complete hyper-scale storage infrastructure designed to meet the requirements of 3rd Platform users and applications. ECS Appliance offers support for rack based solutions consisting of 4 or 8 nodes with up to 60 6TB disks per node for a maximum capacity of 2.9 PB. ECS offers a total cost of ownership (TCO) that is between 9 to 28 percent lower than public cloud alternatives such as Amazon Web Services and Google Compute Engine while eliminating the compliance issues. ECS along with ViPR 2.0, provides universal accessibility with support for block, object, and HDFS protocols. ECS will add file-based access in a future release and add support for new ViPR services as they become available. It features superior economics, geo-efficient protection, multi-tenancy, detailed metering, a self-service portal and billing integration. ECS provides all the software-defined functionality in an easy-to-buy and deploy hardware appliance. This entry was posted in ViPR and tagged 3rd Platform, ViPR. Bookmark the permalink.